So I'm a relative newbie here, but I noticed that Groupthink followed me and thought I'd see if I could post, and lo and behold! I can! I just finished watching Salmon Fishing in the Yemen. It's apparently my weekend for small, charming British films, since yesterday I watched Best Exotic Marigold Hotel. 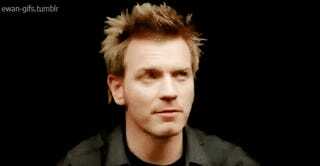 In honor Salmon Fishing, which was wonderful, here is some Ewan McGregor.